Mac用多機能ランチャーアプリ「Alfred」が6周年記念でWorkflows機能などを利用できる「Alfred Powerpack」を3月4日まで10%OFFで販売中。 | AAPL Ch. 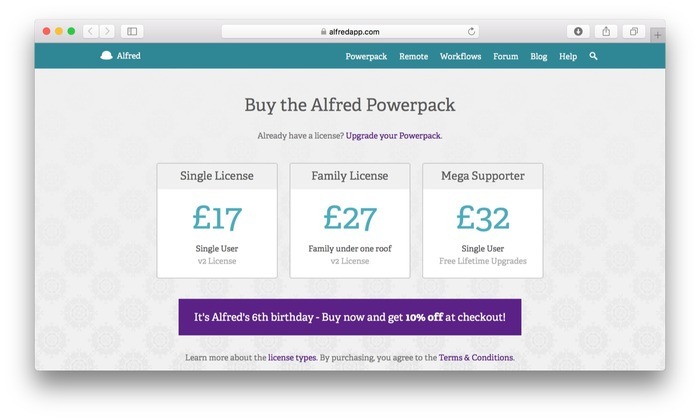 Today is Alfred’s birthday, and this week, we’re offering you a 10% discount on the Powerpack! We’ll be celebrating all week with giveaways and exciting news, so stay tuned. Grab your Powerpack license by Friday 4th March, 2016, to take advantage of the birthday discount – We’re applying the discount to all new purchases at checkout, so no need for codes. The Powerpack is a set of incredibly powerful features, built on top of the robust core Alfred application. Deeply flexible and integrated with OS X, use it to customise your Mac and make you more productive than ever!